The recent good sales prices got to me, so I broke down and tested my brother with the Ancestry.com DNA test . I had held off testing there, not because of the low opinion of their DNA tools held by serious genetic genealogists, but because my ancestors emigrated to the USA so recently that I doubted whether I would have many useful matches in a database that is 99% American. So why do the serious genetic genealogists complain? My DNA cousin and blogger Kelly Wheaton on the DNA-NEWBIE yahoo list described ancestry’s offering as “a dumbed down product on steroids;” which really says it well. She went on to say, “What Ancestry.com DNA testing does better than anywhere else for people with a decent sized tree (1,000 people or more), and who are American or Canadian, is make matches for you. If you have a DNA match and a tree match it does the work for you. Although these suggested matches may not be accurate in terms of who the ancestors in common are for two people who have multiple relationships, for most they do a fine job.” I completely agree with her. By the way, the serious genetic genealogists do not like it because you cannot see where the DNA segment match is and thus triangulate with another cousin to prove that this is the right common ancestor. You have to load the raw data from ancestry to GEDmatch in order to look at the segment overlaps and not all your matches at ancestry will do this. But you have to give Ancestry.com credit for good marketing and for making it easy for folk who are not interested in doing the hard work to prove these relationships. My thinking on testing my brother was that since he has inherited less Ashkenazi DNA than I have, perhaps his test would find some of the possible descendants of our German relatives who may have come over in the 1800s. I had to be careful to register the bar code on his kit to my tree at ancestry, not to the new account I had to create for him in order to get that very low sales price. His results came in pretty quickly, about 3 weeks later. I had already been in touch with this Norwegian-descended 5th cousin twice removed; she matched my dad at family tree DNA. 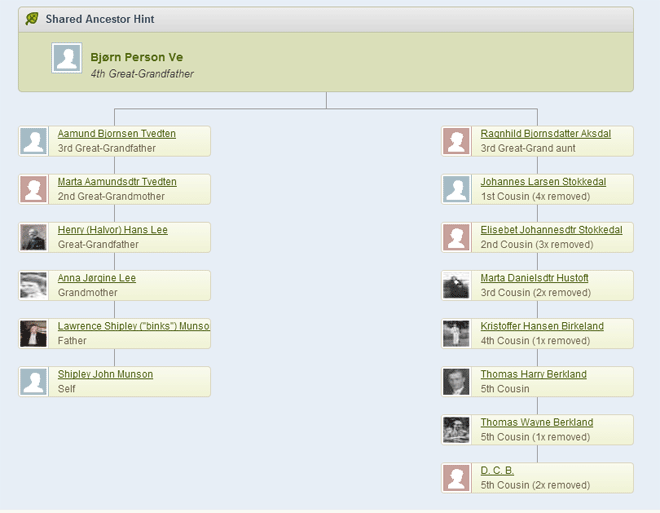 It had taken me some part of two days going through her tree to find that our common ancestor was Bjorn Ve (we are descended from different wives). Ancestry found it for us immediately; what a time saver! On the other hand, by knowing the segment information, I have long since matched this segment match to another closer cousin who is descended from the same ancestor via son Aamund like us. We call this triangulation and without it I would not be sure that this is the right ancestor for that bit of DNA. Sadly, but not surprisingly, my brother has only six DNA matches where ancestry found a match on the family trees (the shaky green leaf). All are distant; 5th to 8th cousins and most including our known 5th cousin are low probability. Three have private trees so the relationship does not get shown until they invite me to see their tree. Although I have written to all of them using ancestry’s messaging system, none but my known cousin have responded yet. Perhaps my new 7th and 8th cousins will get back to me some day. Looking at the pages with all the matches, there are no close cousin matches; the closest ones are 4th – 6th cousins. This was expected, since we are recently European. So far, almost all the matches without matches to their tree are “European Jewish” and have small trees. So I have not written to any of them yet. I did write to two of our scandinavian matches but again no response. Nor have I looked through all 351 pages of 50 matches a page. This large number of matches seems to have hung the Jeff Snavely chrome add-on for ancestry which has been running for 2 days now. Even with just one Ashkenazi grandparent there are way too many matches! So although I am impressed with this “dumbed down DNA test on steroids;” so far it is not much use for my research. No Germans found and no response from the possibly new scandinavian cousins. Using automation to search trees does seem to be the future though. I have used and blogged about the GEDcom comparison utility from DNAadoption.com but obviously it is even better when the DNA testing companies include this in their repertoire. I so totally agree with you. I put my brother’s DNA on Ancestry but then uploaded it to FTDNA and Gedmatch so that I could compare with mine and other cousins from 23andme and FTDNA. 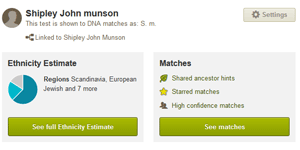 The biggest problem I see with Ancestry is not being able to see where that match is. Another big problem is that you rarely get a response from others, many family trees are allowed to be private or there are no trees at all. Trying to convince people to upload to Gedmatch is only part of the solution. I agree with you that it is definitely lacking in autosomal tools which are necessary and which facilitate the matching process; but I too was impressed by the relationship reports that just popped up like magic in the first five minutes of reviewing the site! And frankly, even before I ordered my AncestryDNA kit, I had given up on the whole chromosome mapping process in lieu of downloading and comparing individual trees for analysis. The latter has been working much better for me. One comment I have to you is that the shaky leaves are not the end all. Sometimes you can get the relationship report graphic to pop up without a shaky leaf (we learned this at the Genetic Genealogy Conference in Washington, D. C. last weekend); So if you have a yellow box that shows you surnames in common, click on one of those and you will probably get a relationship report to come up. Just a suggestion if you haven’t already tried it. A word of caution however on taking those shared ancestor hints too seriously. While I may share a paper trail to the shared ancestor with my match, the hint itself is not evidence that the shared DNA between me and the match came from that ancestor. I tested with ancestry some time ago and have over 50 shared ancestor hints in my results. After recently testing my mother, I learned that 17% of those shared ancestor hints either point to a shared ancestor in my maternal line, but the match *is not* found in my mother’s results or point to shared ancestor in my paternal line, but the match *is* found in my mother’s results. Shared ancestor hints should be taken as a beginning, not an end and unfortunately, ancestry doesn’t provide tools to proceed any further. Don’t you mean the test cost $79.00 instead of $49.00? I think the most serious issue is when people believe that having a common ancestor on several “cousin match” trees means you are genetically related to that ancestor. It does not. It means maybe you are related and nothing more, especially if it is at the 4th cousin and beyond level. I hoped to break down a few brick walls for several grandmothers of unknown parentage. I carefully copied ALL the cousin matches with those names. I noticed a common pattern. A majority to one family but a strong minority to another unrelated family. Go with the majority? Or admit that only using Ancestry results I have nothing. I can transfer my results to the over-burdened and underfunded GedMatch and for a fee transfer to FTDNA (both of which I have done). But with Ancestry results alone – I have guesses only. It is important that new users understand this. Addressing Marci’s comment about new users misconceptions – alas that is human condition on this earth in most of our pursuits – newbies to almost anything have many lessons to learn, and sometimes it is the hard way. Posting helpful hints wherever you can will help some of them wake up a little earlier. I would say I’m at an intermediate level now, but have tacked very long lines onto my Ancestry.com tree, only to find out it was a mistake. I’m more careful now, but still far from perfect. Thanks everyone for all the useful comments and particular thanks to Ginger and Karen for that surname matching feature. I will have to try that. Since my Norwegians did not have surnames as we know them I too often fail to consider that clue. Love the “happy relations” salutation !! Good discussion. Another warning about those hints. Those with colonial ancestry often receive a lot of hints, but that does not guarantee there isn’t another, closer or more distant, match. Again, being able to see the segments and overlaps is helpful. BTW, my tree is private but I will share it with anyone who is seriously researching their ancestry. I figure if they are, they will ask. I just got tired of people grabbing branches of my tree and grafting them erroneously to their own just because the name was similar. What a mess that makes for everyone! Without GEDmatch, AncestryDNA would be almost useless to me. For those of us with deep American roots, the Ancestry test can be an amazing tool. No, you can’t browse your chromosones, but the volume of matches WITH trees far exceeds those of the other testing services. And the liklihood that your match will actually write you back is far greater. I use the Ancestry results to make my matches, and Gedmatch to confirm them. The most likely situation is that Nicole’s father is your father’s half brother so she is your half cousin. That could be if a son of your father’s bio father had a love child also… hopefully your great aunt can help solve this because she knows the tree.